Description: A Meyda original design, the Fleur-de-Lis inverted pendant is an intricate design featuring Purple stylized tri-petaled irises and Azure colored jewels against bands of Green and Umber, surrounding a mottled Blue, Mauve, and Peridot field. Reminiscent of castle and cathedral glass. The Fleur-de-Lis pattern holds a prominent place in French Heraldry. 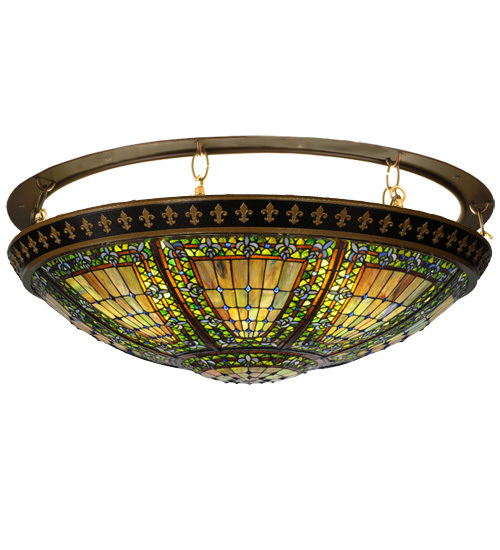 Intricately detailed hardware, hand finished in Mahogany Bronze with Antique Gold accents, cradles a stained glass shade and lighted hub which are hand crafted utilizing the copperfoil construction process that was invented by famed artist Louis Comfort Tiffany. Uses energy efficient GU24 lamping of 8 x 13 - 32w UL Listed for damp locations.